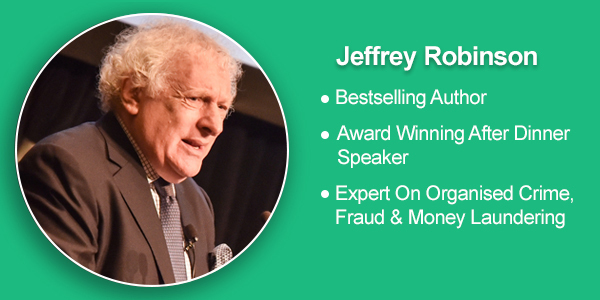 Jeffrey Robinson is the best selling author of 30 books and a popular speaker on the international after-dinner circuit. His money laundering tour de force, The Laundrymen (1993) was a headline maker in 14 countries, establishing him as a recognized expert on organized crime, fraud and money laundering. Actively maintaining that reputation through books, television programs and speaking engagements, the British Bankers' Association has labelled him, "the world's most important financial crime author." Recent media focus has been on The Panama Papers - an unprecedented leak of 11.5m files from the database of the world’s fourth biggest offshore law firm, Mossack Fonseca. The records were obtained from an anonymous source by a German newspaper, which shared them with the International Consortium of Investigative Journalists (ICIJ). The documents show the myriad ways in which the rich can exploit secretive offshore tax regimes. Jeffrey Robinson, whilst writing The Merger, his sequel to The Laundrymen, had a run-in with Mossack and Fonseca, the Panamanian lawyers at the heart of the scandal, he also referred to them in his next book, The Sink, which is a full-frontal expose of the offshore world. No one knows this headline story, and the hidden stories behind those headlines, better than Jeffrey. Robinson is also a popular after-dinner and key note speaker who can keep his audience captivated with his experiences. Jeffrey could be perfect as your next host or guest speaker.